It surprised a lot of people that Plymouth Citybus did not respond to First Devon & Cornwall £1 flat fare on their new 6 route. Meanwhile First are making a significant change in their social media strategy which also makes a lot of sense. 'Morning. Just to let you all know we're in the process of setting up separate Facebook pages for our services in West and Central Cornwall (which will be known as Cornwall!) and Plymouth, South Devon and East Cornwall (which will be known as Devon since all buses in these areas are run out of our depots First in Devon & Cornwall). We're hoping to have these live shortly and will post links for you to 'like' the relevant page for your area here. Our reasons for doing this are so we can make information we post more area specific (for example if you live and travel in Penzance you don't want or care to know about roadworks in Dartmouth!) It also makes it less confusing if we have services with the same number in Devon & Cornwall etc. This combined page will still be live for some time while we launch the new pages and make sure everyone knows about the changes etc so please don't 'un-like' just yet or you may miss out on some important posts! I made this very point recently as part of the on-going discussion over the recently announced fare increases in Cornwall. There have been a few comments highlighting the different approaches for Cornwall and Devon with large increases for Cornwall being detailed alongside all of the fare deals being made available here in Plymouth. When displayed side by side it just looks unfair. As enthusiasts we know that the Cornwall operations are separated from the Devon side and pretty much operate as two different companies. By splitting out the social media accounts in this way, it allows the company to target their customers accordingly. I am sure it wont be too long before we see a new visual image for Cornwall side fleet. The new livery has only just appeared there and as far as I know fleet names are not yet carried on those that are in the new scheme. It would be nice if they can come up with something a bit more interesting than just CORNWALL but even that would be a start! Public Transport Experience But your overweight and elderly explorer was in Weymouth last Tuesday for the launch of six new buses for the town's local services. What about Cornish Fairways for a fleetname ? A bit more friendly and it harks back to the pre-devolutionary phase of the old Western National, when they wanted to proclaim something different. As I recall, it was a bit of a daring move at the time. I'm not surprised Citybus waited a while to gauge the interest in the First 6 service, no point in cutting fares if people aren't attracted to the 6's old buses and awkward route. I guess we will have to wait and see if they both maintain the current fares. With the slightly better buses and slightly higher frequency on Citybus I think they have the edge. I'm surprised they don't offer a cheaper return. With them both offering £1 each way the customers can just get on the first bus that comes along, no need to chose! 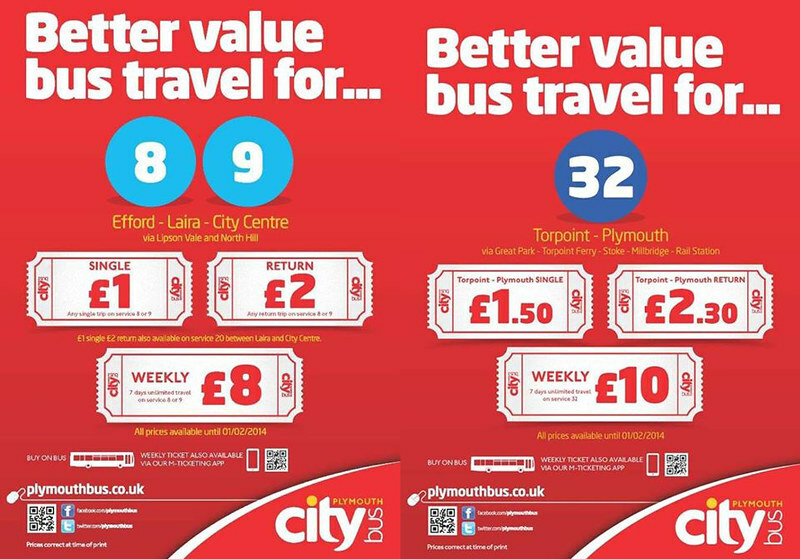 Citybus's £1 fares are only until the end of Jan, though (as per the flyer above). We'll have to see how long First can stay at £1. Standing loads on a B6 don't necessarily mean lots of money. You're only talking 40-50 people and if First is only receiving £1 from each cash fare and (say) 50p for every concession, it's not exactly going to be a money-spinner once they've taken out driver wages, garage and maintenance costs, insurance, fuel, road tax etc etc let alone tried to put aside something towards replacement buses in the future. they may be taking passengers off pcb, but the 6 has 4 buses to run the 6. so wotever passengers that route takes thru the day has to be split 4 ways. so each bus isnt really taking that many passengers. then out of the money they take they have to pay 4 drivers wages, 4 lots of fuel, 4 lots of maintainance. after all that is deducted there cant be much left at a pound a go. at least citybus CAN afford to do it as other routes take more money to balance it out. Not sure about a Cornwall identity but a freshly painted green ex Plymouth Trident has appeared in Somerset this week.